It’s happening – finally! on November 14th Tempi – Roots Music of Denmark – an organisation promoting Danish folk music – are inviting for a reception celebrating the new podcast serie “Spillefolkenes Hemmeligheder – en rejse i dansk folkemusik” (The secrets of the folk musicians – a journey through danish folk music”). The podcast has – at the moment – six episodes in which I am interviewing some pretty significant characters from the Danish musicscene. I ask them about the essens of their work, and together we explore some of their craft’s deepest secrets. At the reception you can experience music and stories by the singer and tradition carrier Mia Guldhammer, musician, composer and multi instrumentalist Martin Seeberg, and musician, programmer and sound designer David Mondrup. Producer: Morten Alfred Høirup. 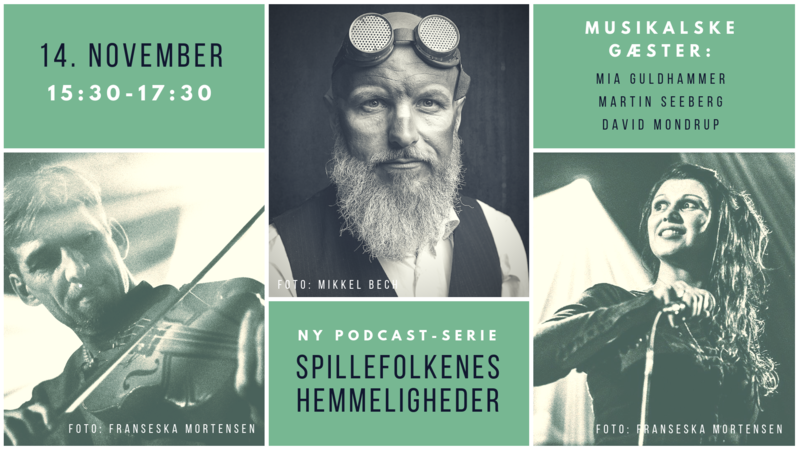 The serie, which is targeting listeners that might be curious, but who are not already part of the folk scene, can be heard at www.radiofolk.dk from November 14th – in Danish that is. The reception is a coperation between Tempi, RadioFolk.dk and Mediehaven, and it is happening in Copenhagen. It is is open for everybody – get more info here!